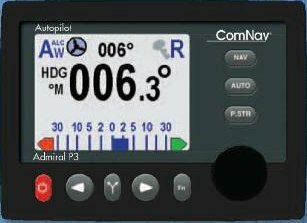 ComNav Marine Ltd., one of the largest privately held autopilot manufacturers in the world has been providing advanced marine navigation solutions for commercial, recreational and government markets since 1982. Today, ComNav's commercial autopilots may be found in fishing vessels, tug boats, tankers, ferries, naval vessels, mega yachts, government fleets and freighters up to 1000 ft in length. For example, BC Ferries specified the ComNav 2001 for its "Century" class, while the Canadian Coast Guard selected Comnav pilots for its new fleet of search and rescue patrol vessels. Comnav Marine, North America's premier autopilot company, is also selected by recreational boaters around the world to supply products for their yachts, powerboats and sailboats. ComNav 1500 pilot models will be working for Canadian and American sailors in the next around the world, single-handed sailboat races.